The belief that death is inevitable is the biggest lie bestowed on man. Who was originally responsible for this lie is immaterial, but it is up to us to wipe it out. Our spirit is eternal and the philosophy of physical immortality gives our bodies a chance to remove this lie from our cellular memories. YES we can break the death habit. Many have done it. Babaji, Bhartriji, are a few examples. Physical death has been a popular belief for only 5000 years! While I was translating Annelies journal into her novel Vanishing Worlds, I learned how this belief in death was programmed into human body cells. Eternal life is consciousness in motion. Love is the energy that can purify our energy field in order to once again experience Eternal life while having a physical incarnation. The scriptures call the human body the temple of god, but unfortunately, it seems that people love their false religions more than the living temple of god; they value their bad habits more than their bodies. Only by cleaning our energy field, that manifests our human temple, from this deadly tendencies and instead fill our minds with wholesome thoughts can we save ourselves. The purpose of all religious scriptures was to teach us how death was created in human history, and how to get rid of it, but instead today they preach to aim for fulfillment outside the body, through death. They are selling death like the adverts on TV. Buy our product and you will never want to be without it. 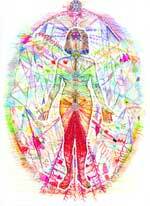 How can we start cleaning our energy field in order to stop the death process? Its very simple: by having the intent to do so. This intent has to accompany our thoughts practically every moment of the day, but… we all know that that might not be so easy. Workbooks on clearing one’s energy field. There are a few workbooks that give us ‘practical tools’ to work with. Tieneke’s creative drawing workbook The Language of Light accompanied with her pocket meditation book is an example. Also highly recommended are the following workbooks; A Course in Miracles, & Steps to Knowledge. These 3 workbooks have one thing in common. They help us to purify our energy field. Annelies’ Our Body Codes of Light workbook also offers ways to stimulate our minds inwards into the very cellular consciousness where the body codes of light will activate our dormant DNA strands; where our ascension codes are stored. The creative decoding exercises in Annelies workbook bring about a change of attitude to life, while at the same time revealing the science of everlasting life. All the above workbooks teach us to be aware of enhancing the texture of the spaces around things. Through the power of LOVE generated through our heart, we can speed up the vibratory quality of all things. In turn these workbooks teach us how to generate and enhance the spaces between things so that every tiny molecule can begin to vibrate more joyfully. Choose to spend most of your time in a healthy environment. Create people around you who practice spiritual purification. Live or work with others who also believe in physical immortality (if possible). Our reality is created by our mind; both our emotional and rational mind is controlled by our environment. We have the tendency to become like the people we spend time with! Look at the people around us. Are their awareness levels stunting our growth? If so, find a way to stop that from happening with GRACE. Many of us came to learn that lesson as being our last one to achieve, before we can move off the human game frame. I managed to translate Annelies’ journal into a story that deals with this very topic; positive and Negative relationships and how it can shape our lives.